It may seem like everyone has an email list these days, but we still learn about seasoned businesses that are looking to build a strong list. Then there are new businesses that are just getting started. We also run into digital marketing agencies that have clients who want to start building an email list but aren’t sure where to begin. In today’s post, we’re going to talk about the importance of having a strong email list and offer tips on the easiest way to get started building your own (or your client’s) email lists. First off, it’s important to know that email marketing is still very valuable. According to Hubspot, Companies using email to nurture leads generate 50% more sales-ready leads, and at 33% lower cost. “Nurtured leads,” on average, produce a 20% increase in sales compared to non-nurtured leads. What’s changing with email marketing is the way consumers prefer to consume their email, and the strategy it takes to continually add people to lists. Are you ready to learn how to get started building an email list? There are dozens of email providers out there, but the following are the ones we prefer. Each one has a free plan, and each offers valuable assets to marketers. We also prefer them because they easily integrate with ShortStack Form Integrations. This is important because running promotions, Campaigns and landing pages are the top ways that businesses collect the email addresses used to build valuable lists. Here are some insights into each provider, plus a look at what it takes to set-up an account so it will work with your ShortStack campaign. 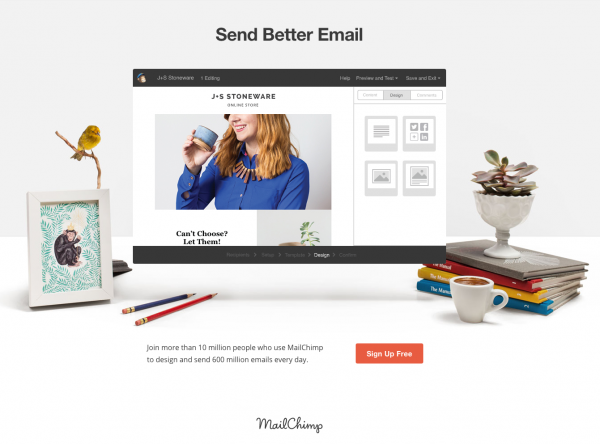 MailChimp allows its users to design, send and track email newsletter campaigns. The MailChimp Integration can be configured to add the entrant’s details to the MailChimp list you choose. MailChimp requires that users “opt-in” to receive your newsletter, so you must have a checkbox field on your form for this purpose. MailChimp also requires an email address, so you must have an email address field on your form. Constant Contact allows its users to manage and send email, surveys, and event marketing to customers. The Constant Contact integration configures the ShortStack form to automatically add an entrant’s contact information to the Constant Contact list you choose. Constant Contact requires that users “opt-in” to receive your newsletter, so you must have a checkbox field on your form for this purpose. Constant Contact also requires an email address, so you must have an email address field on your form. 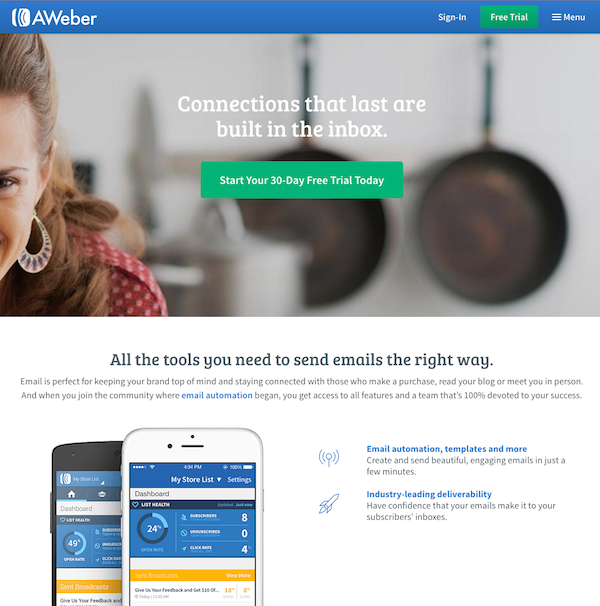 AWeber offers features that include email newsletters, autoresponders, and analytics reporting. The AWeber Integration can be configured to add the entrant’s details to the AWeber list you choose. AWeber requires that users “opt-in” to receive your newsletter, so you must have a checkbox field on your form for this purpose. AWeber also requires an email address, so you must have an email address field on your form. 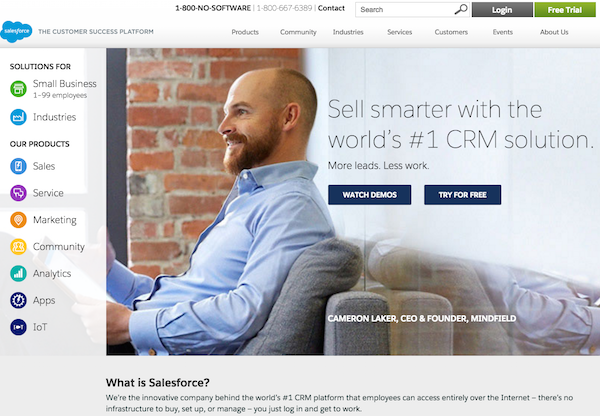 Salesforce is a CRM tool that lets you keep leads, sales deals, and documents all in one place. The Salesforce integration configures the ShortStack form to automatically add an entrant’s contact information as a lead within Salesforce. The Salesforce integration does not update existing leads. All leads gathered through the Salesforce integration become new leads in Salesforce. When searching for an email software service for yourself or your business, here are some things we recommend looking for. Each software platform offers different features. The one that best suits your business will depend on what you plan to do with your email marketing. Two-thirds of emails are now read on mobile devices and this number is only expected to rise. For this reason, software with mobile friendly templates is recommended. Another feature that we look for is ease of use. You’ll benefit from pre-made templates and drag and drop features that allow you to quickly build your emails. While you’ll want a platform that’s easy to use, you also want to make sure you can customize your emails as needed and that you choose software that will grow with your business. You may be building basic emails when you begin but as you and your business grow you’ll most likely need a more advanced email marketing system. Last, we look for a platform that has great analytics. This is important because it will you determine what works for your audience. For example, even though two-thirds of the general population read emails on mobile devices, the majority of ShortStacker users read their emails on the desktop. For most businesses, cost will be a factor in determining the platform they choose. Many services offer a free plan, but what’s offered on each plan will vary. You’ll also want to consider how many email addresses you plan on collecting and then figure out what the costs will be for you to upgrade. Most providers will offer a monthly subscription, but there are also pay-as-you-go options. If you’re serious about building your email list, you’ll want to integrate your email into all of your other marketing strategies. Making sure that you choose an email provider that can integrate with the other platforms you use is essential. Of course, these are not ALL of the things we look for when picking an email software, but it’s a good start. Here’s an article that has 10 questions to ask yourself when choosing an email provider that will help steer you in the right direction. Now that you’ve signed up for your email provider, you’re ready to start building lists! This is where those integrations will come in handy. The most successful way for businesses to grow their email lists is by running a promotion or giveaway — like the kinds you can build using ShortStack. 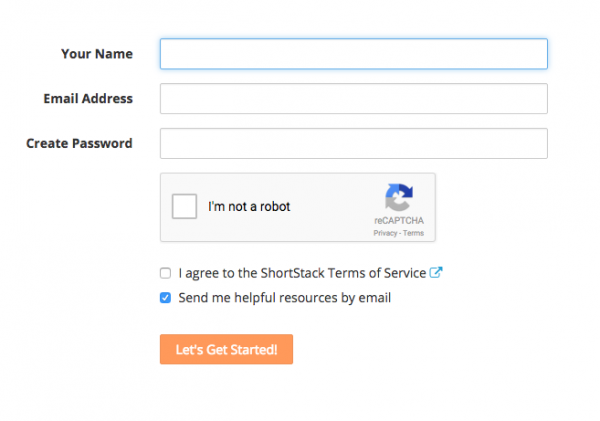 Signing up for ShortStack.com is easy and painless: You can get started for free (no credit card required). That’s it! You’re ready to start creating Campaigns that will help you start building email lists! 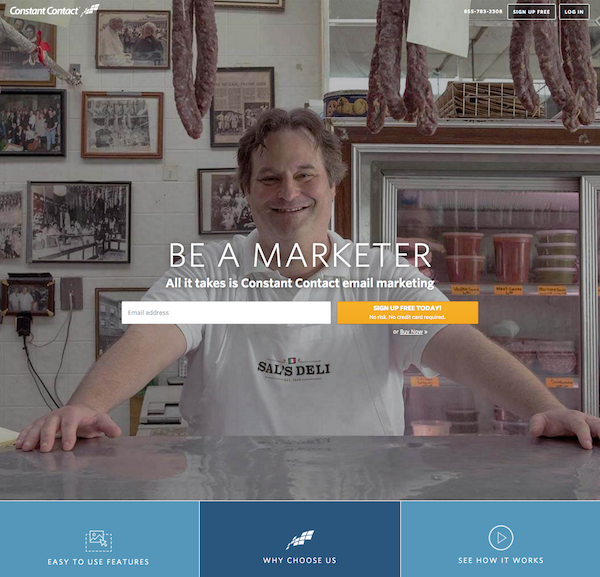 Once you’ve signed up for ShortStack.com you have a variety of options for building a Campaign to integrate with your email marketing service. If you’re brand new to ShortStack, we recommend signing up for a live training session where you’ll learn how to build a Campaign and an email list. If you prefer to skip the live training, you can jump right into ShortStack by starting with a template or with a Blank Campaign. 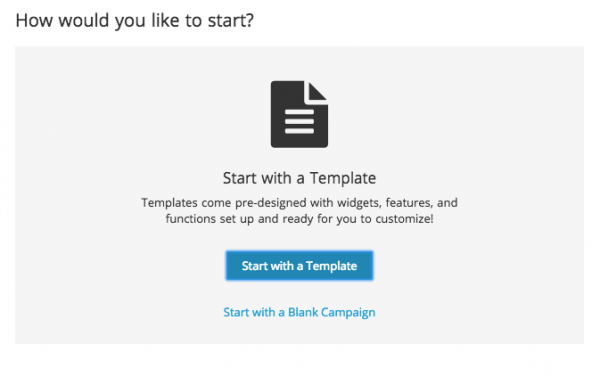 ShortStack currently has more than 90 templates to help you build your marketing Campaigns, and 40 of those are designed specifically for lead collection. Forms & Promos Manager: The Forms & Promos Manager houses all of the Custom Form and Promotion Form databases you’ve created previously, and has links to create new ones. Form Designer: The Form Designer is where your design and build Promotion and Custom Forms. Form Integrations: Form Integrations allow you to submit Form entries into external services automatically. Once you enable Form Integrations, all new entries will be sent to the service you configured. However, pre-existing entries are not retroactively submitted. Now that you’ve signed up for your email marketing service, and you’ve linked your Campaign to your email lists, it’s time to make sure that those who fill our your form or enter your contest, receive valuable information that will keep them subscribed and engaged with your emails. A simple way to do this is by setting up autoresponders using ShortStack’s feature, or your own email service provider. Autoresponders are automated emails that are scheduled to send based on specific actions taken by your subscribers. According to MarketingSherpa, triggered emails sent after relevant on-site searches receive 200% higher open rates and 50% higher click-through-rates. All of the services we’ve listed in Step #2 offer autoresponders so you can quickly and easily have ongoing communications with your customers. When building your auto-responders, use these great tips from Constant Contact. Keep the content timeless – The date when each reader opens an automated Autoresponder email will be unique to them. Keep references to specific dates, holidays, seasons, or events vague in text or photos. Provide answers to newcomers’ frequently asked questions – Since new contacts are often the ones who will receive Autoresponder emails, keep their interests and questions in mind when planning and creating them. Explain what resources are available on your website and introduce key people in your organization. Tell them about who you are and what they can expect from you. Re-use well-regarded articles and information – Use Autoresponder emails as an opportunity to share proven information. Giving tips and how-to’s over time is an excellent way to demonstrate your expertise, build new contacts’ trust, and keep their interest. Create a reason for contacts to engage – Include links to your website, videos, or provide a special coupon or promotional code. Just make sure not to include an expiration date since you don’t know when your contact will sign-up to receive it. Tip: You can always insert a greeting tag into your coupon block to personalize it! Collect feedback from newcomers – To gather feedback from contacts, include a link to a survey and include a Collect Personal Information question. You may want to ask new contacts where they first heard about your organization, why they are interested in you, and whether they have participated in, or used, similar organizations and services before. Collect information about new contacts – Collecting personal information about your contacts allows you to segment your lists and send them more targeted information. If you ask contacts to provide personal information on your Sign-Up Form, they may be hesitant to give it to you because you haven’t earned their trust yet. It’s a good idea to schedule this kind of email for several months after sign-up, after they’ve received several of your standard emails and a few Autoresponder emails, when your contacts are more likely to share information. Most businesses are looking to collect leads from their followers. As marketers, we are always keeping an eye on other Campaigns and strategies that we like for inspiration in our own marketing. For this reason, it’s smart to see if the email marketing service and Campaign marketing provider you use to collect leads have referral services. Referral services allow businesses to make money for referring other people to use their favorite tools. At ShortStack.com, our referral program offers referrers a 30% commission for each person who signs up for our service through your link. Most of the email services we’ve talked about today also have referral programs that are worth looking into. Building an email list does not have to be time-consuming or scary. There are a variety of tools and software platforms available for businesses that make it easy to start collecting leads from your followers in just a few short hours. The most important thing to keep in mind when building your lists is to ensure the content you’re sending to your lists continues to be of value. You always want to track what results in email opens and click-throughs. These stats will provide you with insight into what drives your customers to take action, and that can be used to turn those leads into sales. Are you ready to start collecting emails from your marketing Campaigns? You can get started right now!